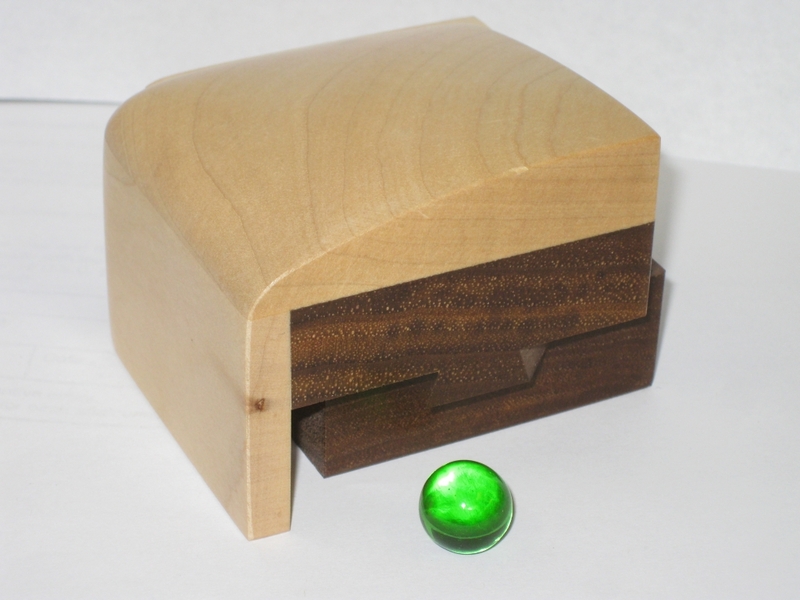 I have been an admirer of Perry McDaniel for quite some time, having come across his work through my own woodworking, and the exposure to Incra jigs. Perry works for Incra and has published books relating to the use of the Incra jigs in making repeatable precise joinery. Nowhere is that more true than in puzzle making. 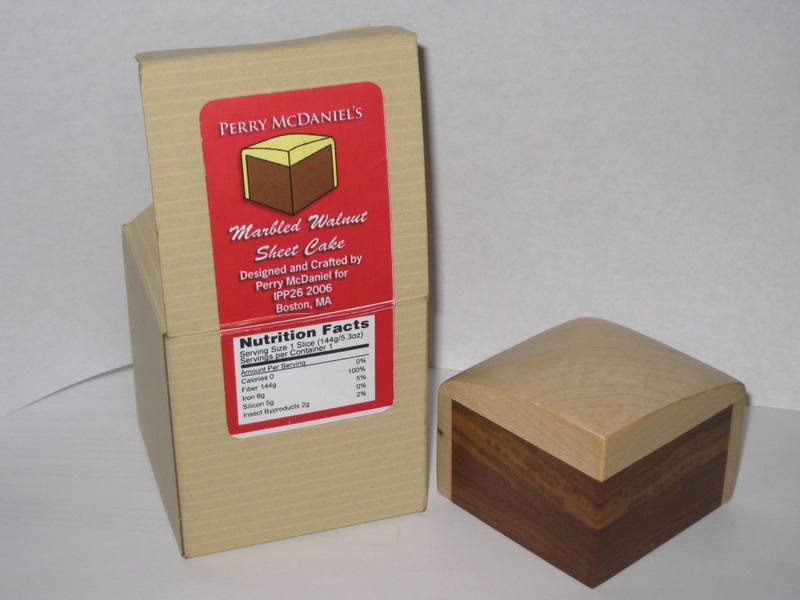 I was recently fortunate enough to be able to add Perry's IPP26 puzzle the Marbled Walnut Sheet Cake to my collection. This striking puzzle is classic of the dovetail work that Perry produces, with amazing accuracy, and a level of fit that makes me strive to be a better woodworker. 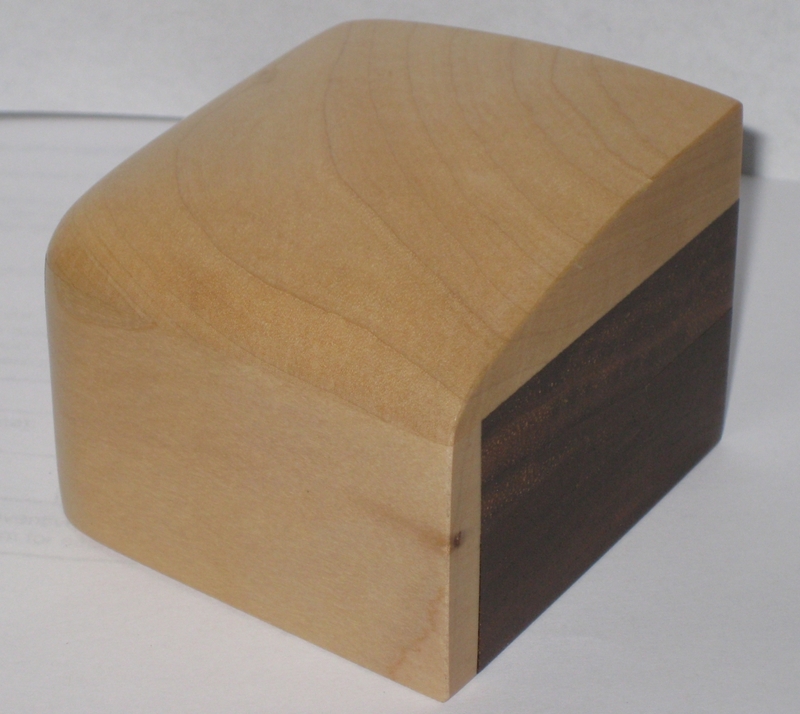 Measuring in at a little over 2.5" x 2" it's a rectangular cake slice made from Walnut and Maple. 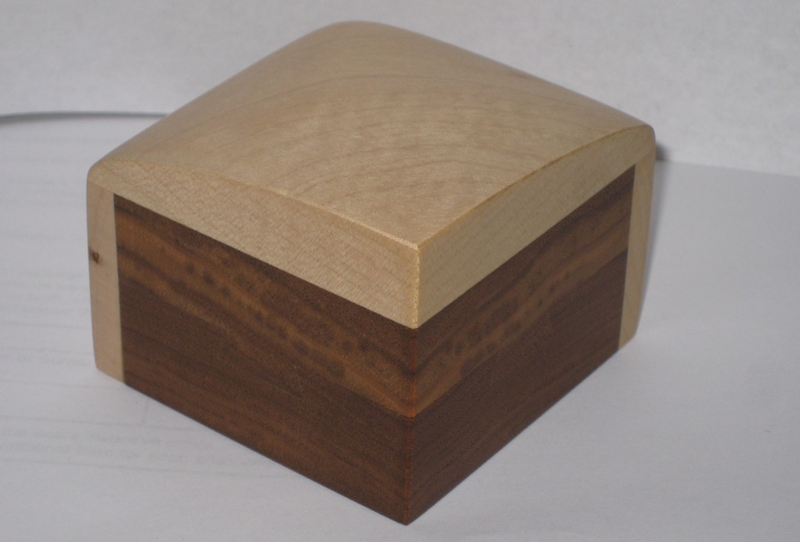 The figured Walnut used at the top of the slice really makes this look all the more like a chocolate sponge, and from a distance it could be easily mistaken. Without looking closely, you'll not even see the join the two walnut halves, and the dovetail on each side is near invisible. The side view shows just how invisible that joint is. The level of accuracy that is achieved here is stunning. And it's even more impressive when you realise that this is only one of 200 copies made, and every one is made to this standard. Even with this level of accuracy, when you find out how to start opening the box, the movement is so smooth it's incredible. The measurement here is so precise that there's no gap, but equally no binding of the pieces. I really do consider this a master class in joinery! (Sorry, I'll stop gushing now). Perry added a great touch by putting some nutritional information on the side of the box. It's a great touch, and really adds some character to the puzzle. I do hope that the boxes survive with the puzzle as it does add to the charm. Getting back to the puzzle itself, on initial inspection there's not much movement, but the twin dovetail will give you a good idea of what needs to happen to open the puzzle. Turning the box around, there's a distinct rattling coming from the box. At this point there's no real indication as to whether that will be helpful or not. I had the distinct feeling that it's not. (Am I getting cynical?) After a short time exploring I found a move which would allow some movement of the puzzle, and the two halves of the cake started to slide apart. It wasn't the end though, as the sliding movement (which is so incredibly smooth) stops a little under half way, and reveals nothing about the mechanism keeping the box locked, or the source of that rattling! I have to admit that I was rather stumped at this point for quite some time, and as with the best puzzles in my collection, when I finally found the final step required, and solved the puzzle, the realisation that the mechanism is so simple, yet stumped me, makes the Aha moment even better when it comes. Understanding how the mechanism work, it's easy to re-open it quickly, and despite saying it more than once already, the accuracy of the joints, and the silky smooth operation easily makes this one of the best made puzzles in my collection. As you can see from the photo above, the source of the rattling is pretty obvious when the puzzle is open. I'm very pleased to have added this, and would highly recommend picking up a copy if you happen to come across one. I did pick up a copy of Perry's Incra book, and have a few of his projects planned. If I can get even half as close to the level of accuracy he is able to achieve I'll be ecstatic.